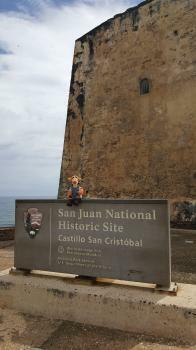 Castle San Cristobal, San Juan, Puerto Rico: 1 of 4 - #History in #SanJuan, #PuertoRico Tigger Travels - Family Adventure Journal Photos From Tigger`s Travels and MORE! 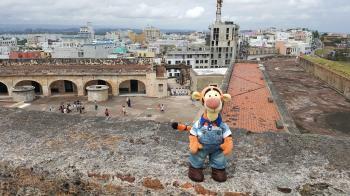 Tigger started his wanderings around San Juan, Puerto Rico by catching a cab from Hyatt House to Plaza Colon. From this rather central point guests can catch a free trolley and get anywhere in Old San Juan. As you get out of the taxi, turn and look up the hill and there is San Cristobal Castle right there! This fort offers great views over San Juan as guests tour tunnels, rooms and exhibits from the active years of this location from as far back as the 1600s! Entrance for guests 16 and over is $5 but that gets you in the other forts, too! 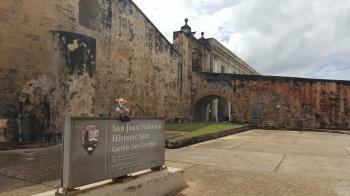 These high walls helped to defend San Juan for nearly three centuries! It is an impressive place to visit and learn!! This ramp is the main entrance to the castle from the top of the hill. It reminded Tigger of the entrance to Helms Deep! Just left of Tigger's head is the entrance to the fort and tickets at $5 for guests 16 and older are sold in that part right behind his head. To the right you can see the sites of several canon installations in those half circle areas. That is built this way so the canons could be moved back and forth and aimed more accurately at targets out to sea. Defenses like these helped to earn the city the title "Gate to the Americas" thanks to its central location in the Caribbean.